Nominal pressure, PN – up to 1,6 MPa (16 kgf/cm2). Valve's versions - normal, export, tropical. Working medium: liquid medium for water supply and sewerage systems, not aggressive and aggressive media, mineral oils and petroleum products. Normal, Explosion proof electric actuator versions available. 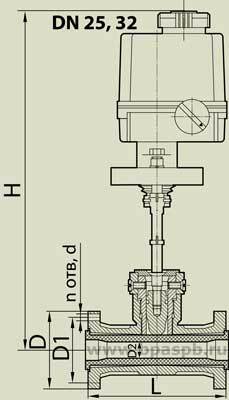 At different valve's position must be installed additional supporting pier for electric actuator. Working position of the valve - with actuator up. Low flow resistance factor - 0,6 for DN 50; 80; 100 and - 0,1 for DN 25; 32. Mechanical indicator of sleeve's rupture availability (pic.1). By the special order the valve is completed with the electromechanical (normally closed contact) indicator of sleeve's rupture (pic. 2). Valve working position - any with additional supporting pier for actuator, except position with actuator down. Actuator's versions - normal and explosion-proof. By the customer request the Pneumatic actuator could be completed with the position sensor.